The New York Times bestselling author of the Seven Wonders series and books in the 39 Clues series, Peter Lerangis, brings us the enthralling first installment of the adventure-filled Max Tilt trilogy. When thirteen-year-old Max Tilt happens upon his great-great-great-grandfather Jules Verne’s unfinished, unpublished manuscript, The Lost Treasures, he doesn’t realize that he’s found the answers to all his problems. And Max has a lot of problems—his mother is sick, his father is out of work, and his home is about to be foreclosed on. But when Max and his cousin Alex discover that Verne’s last work reveals everything he wrote was fact, not fiction, they realize that the book holds the key to something incredibly valuable. A treasure that can save his house—and maybe his entire family. But Max and Alex aren’t the only ones who know about Verne’s clues. Spencer Niemend, a strange skunk-haired man who has spent his life researching Verne’s works, is bent on reshaping the world with the hidden treasure. 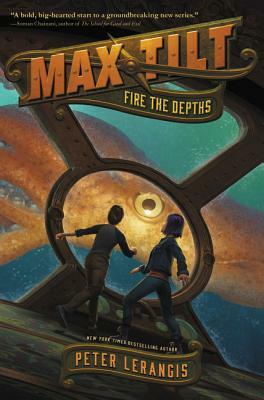 To find it first, Max and Alex must go on an adventure that’ll take them from the broken remains of an underwater city to the very jaws of a giant squid to the edges of a whirlpool from which no one has ever emerged alive. This is the first book in a new hair-raising, edge-of-your-seat adventure series from master storyteller and New York Times bestselling author Peter Lerangis.